Investors are seeking answers – and instant, calming solutions. These "experts" and "systems" are offering just that – most of which is the same. "Markets rise and fall," the experts say as a chorus, "just be diversified – hold stocks and bonds – and carry on. The economy is strong, employment is high, inflation is low, and the markets will stay the steady course over time." Every market crisis is preceded by a debt crisis and "solved" by a currency devaluation. Every one. Every time. Period. As for such "debaucherous" debt bubbles, they "pop" when the cost of carrying that debaucherously high debt gets too painful. 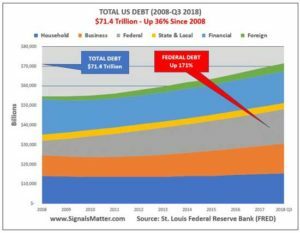 You see, the United States is in debt like never before, and yet because rates are still low, we, as a country, have been able to get away with deficits (i.e. a credit card "recovery") with no ill effect for decades. Such debt-driven peace of mind has convinced many that the United States can run forever with what Jacques Rueff described as "deficits without tears." And as the chart to the left clearly shows, we can run massive deficits (grey line) without "tears" simply because interest rates (black line) have been artificially stapled to the floor, since the mid-1980s in general and 2008 in particular. But here's the rub: Rates are rising due to market pressure (rather than Fed "control") and the cost of that debt (i.e. the "interest expense") is edging higher, like you see at the left. This means everyone from Joe Six-Pack to the U.S. government is about to face increased – dare I say "tearful" – debt expenses. Uncle Sam's deficit spending is increasing at an annual rate of $1.2 trillion. 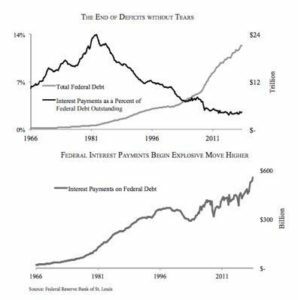 How is this rising debt expense ever going to be paid? History confirms the very simple answer: The United States will devalue its currency to solve its debt problem. That means the Fed will once again start printing money out of thin air. And again it will refer to the exercise euphemistically as "quantitative easing" – i.e., "faking it." If they don't print more magical money, there will be no new "credit card" money to continue supporting an already artificially supported bond market. This means bond prices will fall and thus bond yields (and the interest rates they, not the Fed, push) will naturally and mathematically rise. We've seen the first early symptoms of this in real time, in seven short months. From June to December 2018, the FAANGs – Facebook Inc. (NASDAQ: FB), Apple Inc. (NASDAQ: AAPL), Amazon.com Inc. (NASDAQ: AMZN), Netflix Inc. (NASDAQ: NFLX) and Alphabet Inc.'s (NASDAQ: GOOG) Google – have dropped a whopping 32%. Our completely broken and overlooked bond market is even more of a distorted danger zone for otherwise unwitting investors. The most obvious symptom of this distorted credit bubble is the so-called "high yield" bond market, which is in fact, a low-yield minefield. For these junky companies that perpetually need more borrowed money (by issuing bonds) to pay back their maturing and perpetually "rolling" debts, they face a tearful problem. Namely, the new interest rate they have to pay today is 6.5% – to cover yesterday's debts pegged at 4.125%. As interest rates continue to rise in the face of a cornered Fed and mushrooming Treasury supply – over $1 trillion worth of "IOUs" per year – just to pay for our public debt rollover, these tears will turn into sobbing fits. That is, at some point soon (one we are tracking carefully), the bubble in U.S. stocks and bonds will do what all bubbles throughout history have always done, namely: "POP!" Why? Because today's debt crisis – which includes everything from real estate, corporate bonds, student debt, government deficits, and car loans – is far worse than just the sub-prime mortgage crisis of 2008. So, there we have it folks. 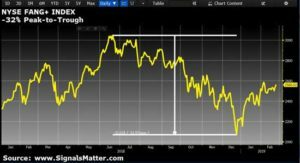 Our debt-soaked, artificially supported securities market is facing an inevitable and interest rate–driven "uh-oh" moment. It will print dollars and rot out an already-weakening U.S. currency. Yes, that's the same currency you take home for pay and that you use to provide for your family and future, just rotting away. One does not need to be a "gold bug" or precious metals peddler to see this. I'm certainly not of that stripe. But if you invest for the long term with a respect for history, that volatility won't bother you a bit. And the security will help you sleep better. Owning a smart allocation of these metals – the Swiss, for example, typically hold a 10% allocation in gold as "insurance" – makes far, far more sense than anything we've seen coming out of D.C. or Wall Street since 2008.